Waist Stretched: up to 38"
How fun are these? Soft-as-a-kitten from top to bottom, designed especially for our petite sizes. 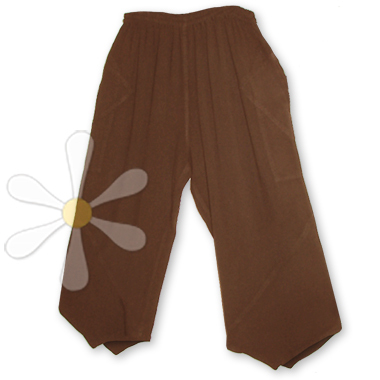 There's a soft and wide elastic waist in three rows to resist rolling, and deep side-seam pockets. What's special are the unique angular piecing details -- the decorative topstitching echoes the geometry everywhere, most especially around the pockets.. and o! the fabulous pointed hems! This unusual design will make you feel like you just stepped out of a North African bazaar, Middle-Eastern souk, or one of Scheherezade's Arabian tales!